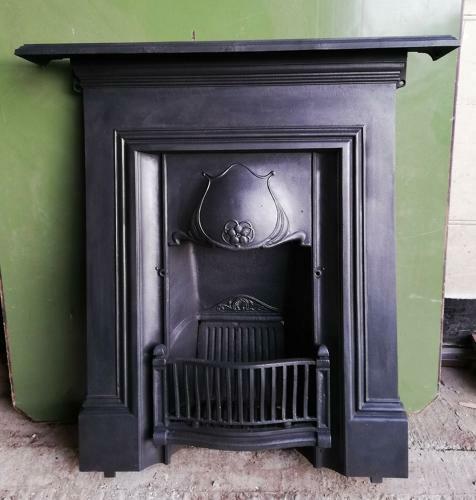 A very pretty Art Nouveau cast iron combination fire. The body of the fire is approximately 30", ideal for a bedroom or smaller reception room and has a fantastic design. The fire has the original domed smoke hood with a flower design, typical of the period. There is a simple border around the fire opening and pretty motif above the concrete fire back. The iron has been blacked and polished giving the fire a good finish. Both fixing lugs are present. The fire has a replacement smoke flap as the original was damaged. The fire has some slight signs of wear as expected of antique items. There are some small casting marks and scratches. The back has surface rust as expected and there are some very small patches of surface rust to the grill. The concrete fire back has some cracks. The fire has a very pretty look that would add charm to a period home. A well made and desirable item with a high quality design.